I recently heard a great quote, “If you take the text out of context, all you’re left with is a con.” It’s a quote that seems to describe Dr Leaf’s social media pings quite nicely over the last twenty-four hours. Dr Caroline Leaf is a communication pathologist and a self-titled cognitive neuroscientist. She is also a self-titled theologian. Today she posted, “3 John 2 = Mental Health ‘Beloved, I wish above all things that thou may prosper and be in health, even as your soul prospers.’ Everything relies on your soul, which is your mind, prospering” (original emphasis). It should also be noted that the two words used in ancient Greek that referred to our inner reality were pneuma (‘spirit’) and psyche (‘soul’). According to Thayer’s Greek Lexicon, the words pneuma (‘spirit’) and psyche (‘soul’) were often used indiscriminately. The Apostle Paul distinctly used the word pneuma separately to the word psyche in 1 Thessalonians 5:23, but nearly every other New Testament writer wasn’t so precise. Thus, John wasn’t referring to the mind at all, but probably our spirit, or at the very least, our generic soul, not specifically to our mental faculties or our thoughts. 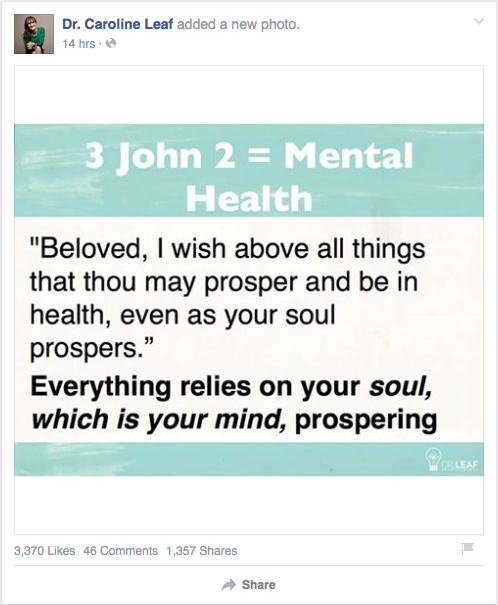 The scripture in 3 John 2 doesn’t have anything to do with our mental health. Yesterday, Dr Leaf tried to merge one of her favourite authors views with scripture. She posted a quote from Dr Bruce Lipton, “Genes cannot turn themselves on or off. In more scientific terms, genes are not ‘self-emergent’. Something in the environment has to trigger gene activity.” Dr Leaf added, “That ‘something’ is your thoughts! Read Proverbs 23:7”. So what is it with the second half of the verse? If this scripture is all about our thought life, then what’s the eating and drinking half of the verse got to do with our thought life? The other half of her meme comes from Dr Bruce Lipton, an agnostic pseudoscientist who was a cell biologist before he flamed out, and now teaches chiropractic in New Zealand. He believes that there is a metaphysical link between our thoughts and our cell function . He’s ignored by real scientists (http://goo.gl/cX7Aeg). As for his quote, it’s a misdirection. Sure, genes aren’t self-emergent – they don’t think for themselves. DNA is just a long chemical string which just carries a code, the biological equivalent to your DVD discs. Like a DVD, DNA isn’t worth anything if it doesn’t have a machine to read it. In every cell, there are hundreds of proteins that read and translate DNA. Those machines respond to the external environment, but they also respond to the cells internal environment, and to other genes themselves. Simply put, DNA is decoded by intracellular proteins, but intracellular proteins are only made by the expression of DNA, which happens all the time. A single-celled embryo becomes a baby because of DNA self-copying and expression that happens a trillion times over by the end of pregnancy. So while a single gene can’t turn itself on and off, the genome as a whole is essentially self-controlling, only being partly modulated by the external environment. Genes are turned on and off all the time by other genes through the proteins those genes make. 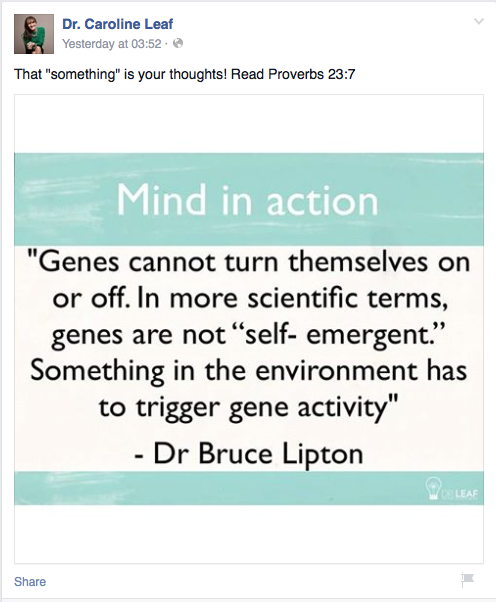 Lipton’s assertion that “something in the environment has to trigger gene activity” is simply nonsense. So Dr Leaf uses a flawed quote from a pseudoscientist to try and back up her specious interpretation of an out-of-context verse of scripture. Somewhat poor from an “expert” theologian and cognitive neuroscientist really. These memes speak to the issues of trust and legitimacy. Dr Leaf can call herself whatever she likes, but how can church leaders continue to endorse her to their congregations as an expert when she consistently misinterprets science and scripture? Can they honestly look their parishioners in the eye and say that Dr Leaf’s teaching is accurate? Can they stand at their pulpits and confidently support her book sales at their back of their churches? Dr Leaf needs to re-evaluate. She needs to re-evaluate her claims to be an expert in cognitive neuroscience and the Bible. She needs to re-evaluate the quality of information that she relies on. She needs to re-evaluate what she’s trying to achieve in posting to social media, and re-evaluate the accuracy of her memes. Because ultimately it’s the truth that sets people free, not errant opinions and misinterpretations. Lipton BH. The biology of belief: Unleashing the power of consciousness, matter and miracles: Hay House, Inc, 2008. Addit: Dr Leaf’s social media post in between the two memes mentioned above was also a doozy. A repeat offender, as it were, since she has posted it several times before, and I have blogged about it here. This entry was posted in Biological, Caroline Leaf, Psychological, Spiritual and tagged 3 John 2, cognitive neuroscientist, criticism, DNA, dr bruce lipton, dr caroline leaf, Dr Leaf, Facebook, genes, meme, mind, prospers, Proverbs 23:7, soul, thought by cedwardpitt. Bookmark the permalink. i have been fascinated by what has been on Christian TV by Dr. Leaf! I am just an old gringo in medical or theological language in this area! Meaning I love to read and study with no degree behind me! I am not a scientist or doctor! Spirit was popular by Dr. Tim LaHaye! Are any of her teachings similar? What is she writing that is useful? Hi Gerald, There’s nothing wrong with being an ‘old gringo’. Your willingness to consider her work in depth and be open to alternatives is fantastic. I have to confess, I’m not familiar with the work of Dr La Haye that you spoke of. In terms of what part of Dr Leaf’s writing is useful, that’s potentially complex. On her social media pages, she will often put up a scripture without added interpretation – no problems with that. Occasionally she’ll put up a generic health fact that one can find on any drug-store health leaflet. Unfortunately, that’s where it ends. Dr Leaf’s biggest problem comes from her foundational assumptions, the mind being synonymous with the soul, the mind being the controlling force, the mind being separate to but in control of the body. These sort of assumptions sound reasonable but with deeper thought, are subtly wrong. This sets her on a tangent which affects the rest of her interpretation of science and scripture. Have a look at her “Scientific Philosophy” page of her website and see if you agree with me. By the way, I’m all for applying Gods word to our lives, but not applying Dr Leaf’s interpretation of the scripture.